Floatex Filter Sand Washing Plants can easily surpass the sand cleanliness standards required by the UK Water Utilities, with configurations available for filter stations where the water is drawn from either fast or slow flowing rivers. These plants are based on equipment that has been designed for the mining industry, this makes them robust and extremely reliable. Floatex Sand Skimming Beams Beams dredge the sand from the bed, enabling the fast turn around of slow sand filters, as there is no loss of throughput due to draining and recharging the bed also the beds are capable of returned into service within a much shorter time. The beams can also be equipped for Wet Resanding which has the advantage that the sand will settle quicker and therefore result in a more evenly compacted bed, additionally as the sand is laid from a fixed reference point the surface of the bed is level. Sand / Carbon Separation The new trend for placing activated carbon within the slow sand filter, requires that when the carbon is exhausted it must be separated from the sand for re-activation. 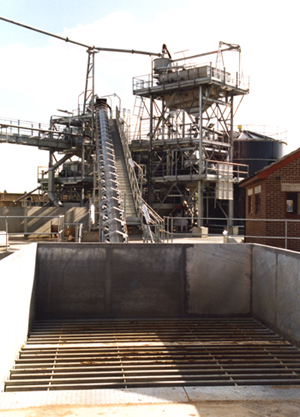 This separation process was developed by Floatex using our experience in mineral separation. The function of sand / carbon separation can also be incorporated in to a Floatex Filter Sand Washing Plant, minimising the equipment required at a filter station.